Just like you, your engine needs to breathe. 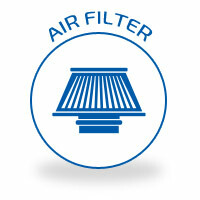 Dirty air filters prevent your engine from getting the air it needs, making it difficult to perform efficiently. Changing your vehicle’s air filter is one of the easiest and least expensive things you can do to maintain your car’s performance. Even if the filter doesn’t look dirty, hidden debris may be slowly choking the engine. We recommend replacing the filter at set mileage, according to the manufacturer recommended maintenance schedule. This is the minimum standard – in fact, you should replace the filter anytime it is dirty. Local conditions in Alabama, including dust, pollution, and pollen floating in the air, mean the air filter traps these contaminants more frequently and becomes dirty faster. Dirty air filters are not a small service to put off – they mean poor performance, reduced fuel economy, lower miles per gallon, and spending more at the pump. Every time you bring your vehicle into Melton Automotive for a full-service oil change, our ASE Certified technicians will inspect your air filter and show you its condition. When it’s time to replace it, we’ll take care of you quickly – all during the time of your normal oil change. Learn more or schedule your next oil change by calling 205.663.6088.